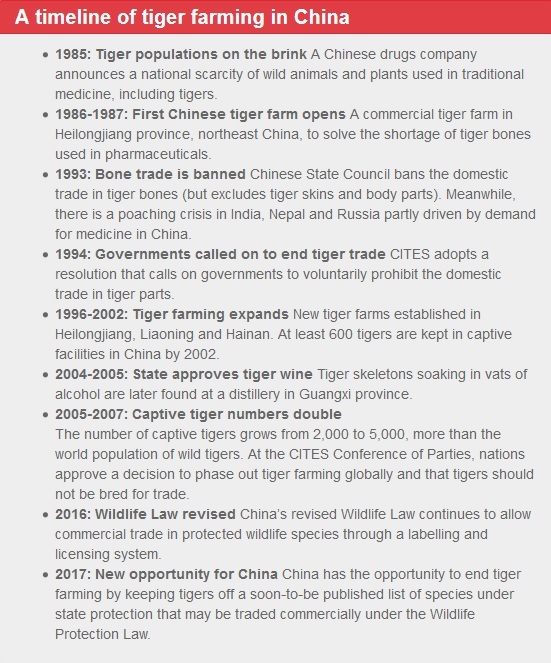 Instead, they were to become the founding population of China’s first commercial tiger farm. 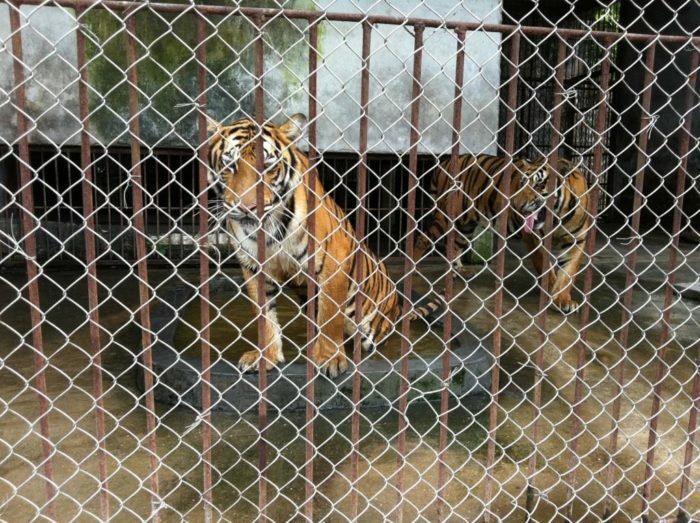 They had been brought together by the Ministry of Forestry at a fur farm in Heilongjiang province to establish the Hengdaohezi Breeding Centre, founded as a Government-funded operation to breed tigers for profit and supply bones for medicinal use. It has since been implicated in trade in tiger products and also functions as a tourist attraction. The move marked the beginning of a cruel chapter in the history of their species, which was to have a devastating impact on tigers across the world. Fast-forward three decades. There are now 5,000-6,000 tigers kept in more than 200 facilities across China. Among these are large-scale farming operations, including the Harbin Siberian Tiger Park and Xiongsen Bear & Tiger Mountain Village in Guangxi, each of which now holds more than 1,000 tigers. Captive tigers are also kept in smaller facilities across the country, from ‘zoos’ and circuses to backyard enclosures. Many of these tigers are kept in horrific conditions, in cramped concrete enclosures without any kind of mental stimulation. Many captive tigers exhibit symptoms of severe mental and physical distress and genetic deformities suggest serious in-breeding. 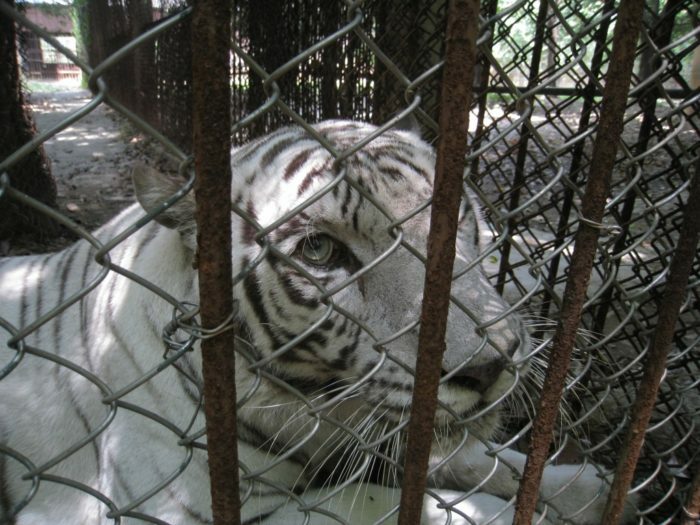 Recent footage from Chinese zoos and other facilities has revealed emaciated, starving tigers; obviously sick tigers in tiny, squalid enclosures; and the use of cruel restraining techniques to allow paying customers to pose for photos sat atop a tiger. There are fewer than 4,000 wild tigers left on Earth – a decline of 96 per cent since the start of the 20th century. The main reason for this decline is poaching to feed Chinese demand for their skins, bones and other body parts. As the number of captive tigers in China has skyrocketed, wild populations have been in freefall. The tiger of Chinese literature and legend, which once prowled the hills and valleys at the heart of the country, has never recovered from the slaughter of the 20th century when wild tigers almost entirely disappeared from China. A tiny population clings on in the remote north-east of the country, along the Russian border, with numbers ranging from seven to 27 animals. At many facilities in China, visitors can pay to get close to tigers by taking bus ‘safaris’ through enclosures or posing for selfies with tiger cubs or sedated adults. Videos from Harbin Tiger Park show tigers living in unnatural ‘herds’. Visitors can pay to feed the animals and can witness live animals being killed and devoured by as many as 20 tigers at once. There is nothing natural about such behaviour. Wild tigers are solitary creatures that depend on their hunting skills to survive. While these captive tigers may share the same inherent ability to kill as their wild brethren, they have not learnt the skills of what to kill. Tigers that have been raised in these environments will kill whatever is quickest and easiest upon release, be that livestock or people. Growing up around people, they lose their fear of humans. They would pose a serious danger to local communities if released and would be condemned to a life of persecution. Many facilities that keep captive tigers in China have been exposed trading products made from tiger parts. 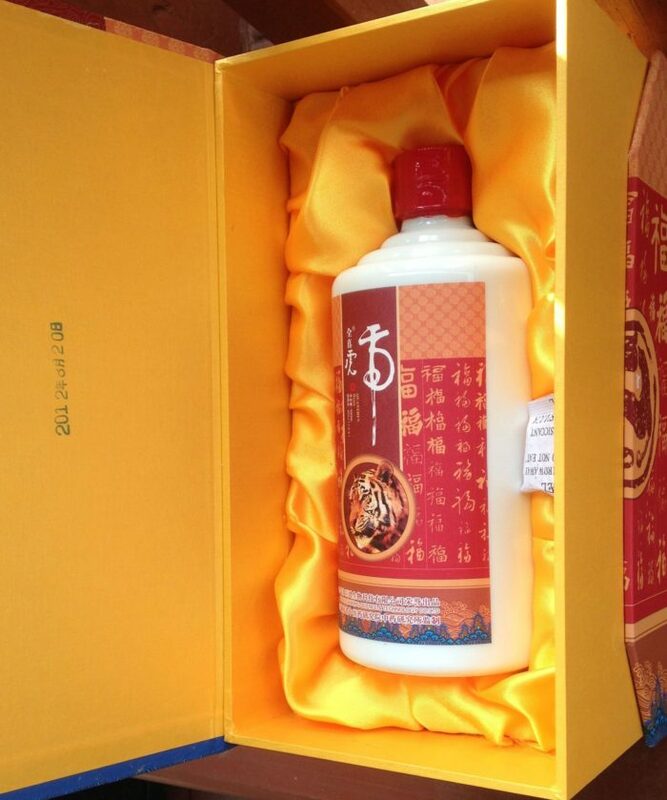 The Harbin Siberian Tiger Park and Xiongsen Bear & Tiger Village have both been documented on multiple occasions trading ‘wine’ made by soaking tiger bones in alcohol. Production and trade of this ‘tiger bone wine’ has also been documented at various ‘zoos’ around the country. The Chinese Government is apparently complicit in perpetuating the tiger trade. Despite a 1993 directive, which prohibits all trade in tiger bone and its use in medicine, tiger bone wine appears to be produced and marketed with express government authorisation under a 2005 Notification. 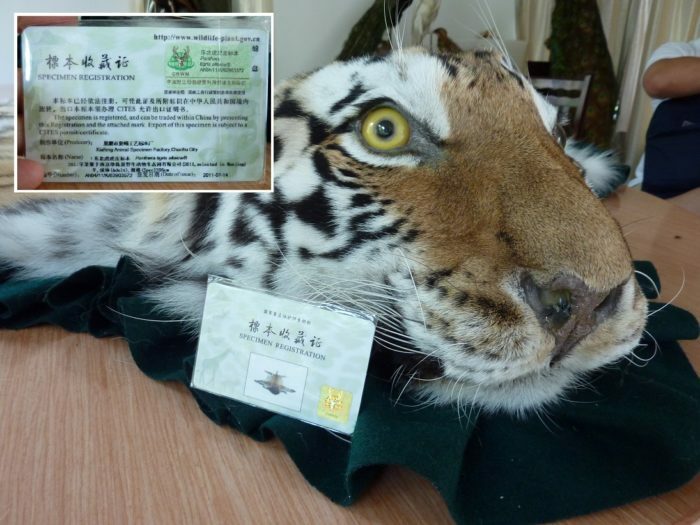 In 2013, the Environmental Investigation Agency reported on the commercial sale of luxury rugs made from the skins of captive-bred tigers, which were being offered for sale with permits issued by the State Forestry Administration. The skins are being sold under an official ‘labelling’ system which permits legal trade in products made from protected species. The weak control systems and the deliberate inflation of market prices to ensure profit for the limited number of authorised dealers created a market that was undercut by cheaper illegally sourced ivory. At one point up to 90 per cent of the ivory on the market was illegal. The Government of China recognised the role the legal trade system and demand was having on wild elephant populations and committed to phasing out its legal ivory trade by the end of 2017. Recent years have witnessed the emergence of tiger farming across South-East Asia. Hundreds of captive tigers are now held in commercial breeding facilities in Thailand, Laos and Vietnam. As tiger farming and trade in captive tigers has proliferated in China and South-East Asia, so too has illegal trade. In India, 2016 saw more tigers poached than any year since 2001. The world’s last remaining wild tiger populations are paying the ultimate price to feed demand that is stimulated by Chinese policy. They simply cannot withstand this level of killing. Tiger farms were back on the global agenda at the 2016 CITES meeting, at which the international community reiterated that tigers should not be bred for trade, agreed on a plan of action to identify problem facilities and encouraged the destruction of stocks of tiger parts. At this meeting, Laos announced that it would be the first country to phase out its tiger farms. With fewer than 4,000 tigers remaining in the wild, every single tiger counts. 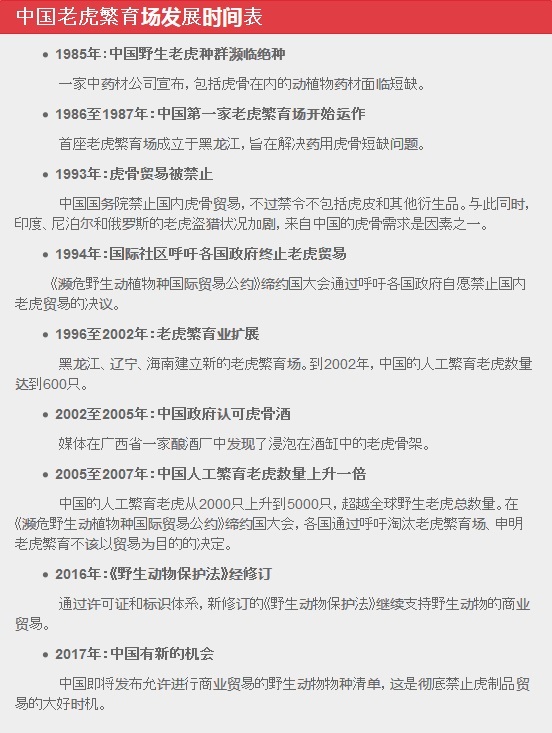 In 2010 at a tiger summit held in St Petersburg, Russia, then-Premier Wen Jiabao made a statement that mentioned ending “tiger trade”. Unfortunately, this intent has not been taken up by the State Forestry Administration, which has continued to allow and promote commercial breeding of tigers and trade in their parts and products. With the recent closure of its legal ivory market, the Chinese leadership has shown it is willing to take the action required to save a species threatened by trade from extinction. Sadly, this willingness has not yet been extended to tigers. It’s clear that there is growing support for ending tiger farming in China. A proposal was put forward at this year’s CPPCC plenary session to end tiger trade and phase out tiger farms, and new Government plans to establish a huge reserve in north-east China for tigers and leopards, are a positive step. But until commercial breeding and trade of tigers and their parts are phased out, this policy will continue to undermine any other attempts to save China’s tigers.